No, they are in the "Where to Display" Treeview. Drag and drop information to the "Where to Display". I am using IPTV on DVBViewer with an M3U URL. I have created an ini Channel File too. I have a url to the EPG data will connects to a .dtd file. However, I'm stuck at the very beginning in that what is my XMLTV TV Data File ? Or how can I create one ? In Xepg click "Add" button, then key in the URL in the field "Grabber executable/URL". Supply a file name of you own choice in the "XMLTV TV Data file" field. Click the "Help" buttons around Xepg for further information. I'm using xepg and it runs with dms on my server. My kodi-clients get the epg-data, but no DVBViewer-client. 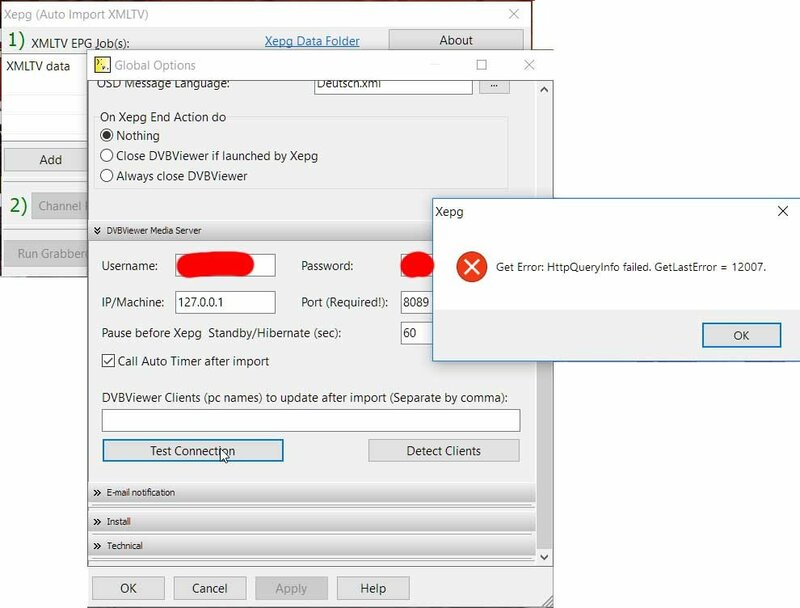 Detect Clients (button): Adds the DVBViewer clients (pc names) which have been connected to the DVBViewer Media Server since the last DVBViewer Media Server restart. If you miss a client, relaunch it and detect again. So, try to close and open all of your DVBViewer clients. Xepg version 0.7.3.0 is available. This version takes advantage of the new EPG update strategy in DVBViewer 6.1.2 and DVBViewer Media Server 2.1.2. Details in the changelog. If you want to (temporarily) see the native (DVB) EPG instead of the external EPG for a channel, just unpair the channel in Xepg and do a Test Import. The new channel pairing will immediatly take effect in all DVBViewer clients, running or not. No need having to relaunch all DVBViewer clients any more. NOTE: You should only upgrade Xepg to version 0.7.3.0 if you have upgraded DVBViewer to 6.1.2 (and DVBViewer Media Server to 2.1.2). Hello @Delphi you are the programer off the tool ? I have a problem ? There are too channels that have no epg data. The data is on the xml file but after import there is no data on epg. I have mapped it. On Clickfinder there are data seen in the program. Hello @Delphi you are the programer off the tool ? The red ones are XMLTV IDs. They MUST be different for different channels. Seems that you have 2 xml files: TVMovie.xml and EPGBuddy_1.xml. In essence they are treated as one long file, so XMLTV IDs must be unique across both files. I am not able to download those via your link. Please zip them together into one zip file. This is wrong, sorry. If you use EPG sharing the XMLTV IDs can be present multiple times in the LOG file. Please zip all the files together. Also,, I need to know the DVBViewer channel names and the XMLTV channels (display_name and XMLTV ID) which are problematic. Hm the 2 channels for example are n-tv and welt, i dont know where i can find the xmltv id. 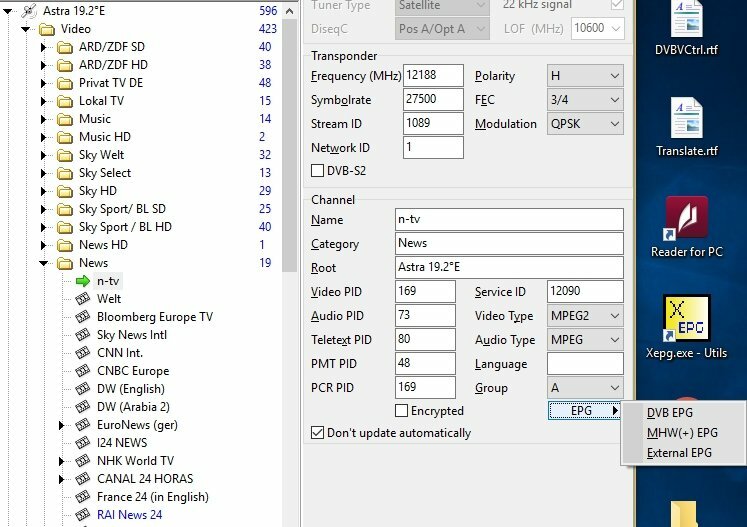 in the program it should be namend ntv or ntv b i use 2 different tools now, to test, but by both i cant get the two channels fill with epg. Hm where i have to set this up ? This channel is fill up with epg, all works fine. So here i have the zip file with (i hope all of the needed files) for you. In the news catagory you have all EPG Flags unchecked for those channels. That's why the EPG is not shown. Check it out in the DVBViewer channel editor. In general you should have ALL EPG Flags checked for ALL channels. External EPG is automatically displayed if present, since it has the higest priority. Only in very special cases it is needed to manipulate the EPG flags (certain RTSP devices). Oh ok many thanks to you. I dont have seen this. I have unchecked all an than all only external epg. So there must be a mistake. I try it. Thank you very much. I use DMS only as Server im looking over the network with kodi. So someone told me i should only use external epg. Is it this channel we are talking about? It is a bit confusing, since the the channels n-tv and welt exist in several places. As you see all epg flags are unchecked. That's why you don't see the EPG. EDIT: It's not a good idea to produce an answer to a post by completely change a previous post I overlooked it. Yeah, i post 2 screens, but over my post you have post the help. So i changed it. No it works, you have right, there are several channels with this name. so now i have all of them and the epg is there. Many thanks for your great support. So you tool works fine, and that was my problem. 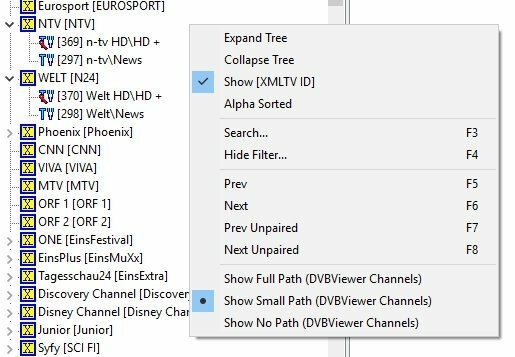 ich bin neu hier, komme ursprünglich vom MCE, bin nach abschalten der MCE-Community aber auf der Suche nach einer neuen Lösung bei KODI mit DVBViewer gelandet. Ich nutze den DVBViewer Pro Version 6.1.2 und den DVBViewer Media Server 2.1.2 dazu. In KODI läuft soweit alles, jetzt wollte ich mein EPG etwas aufbessern. 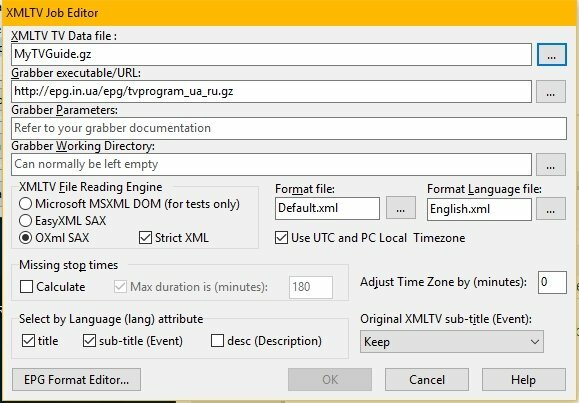 Ich habe immer noch ein laufendes Clickfinder ABO, über EPGBuddy und XEPG 0.7.3.0 wollte ich das EPG zum DVBViewer importieren. Leider scheitere ich an der XEPG Einrichtung. 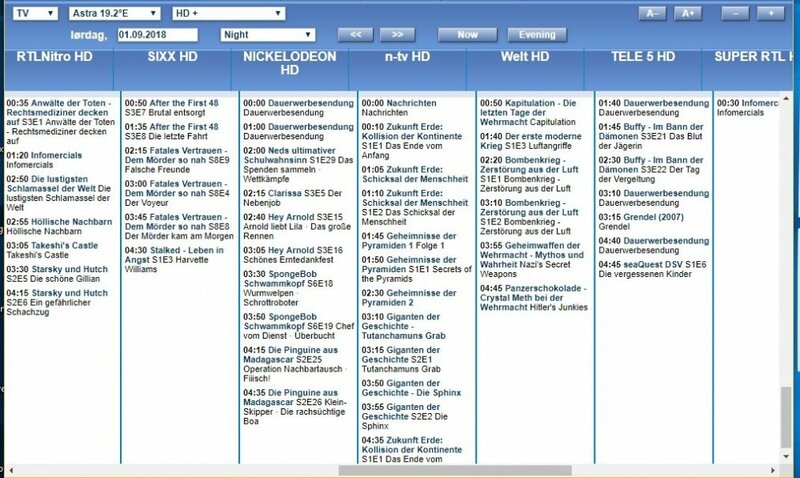 Grundsätzlich findet XEPG den DVBViewer und startet ihn auch für die genannten 6 Sekunden, nur der Test der Verbindung der Click auf Clientsuche bringt die u.a. Fehlermeldung. Kann mir jemand an der Stelle weiterhelfen, ich sitze seit einigen Tagen an dem Problem, aber ich finde keinen Ansatz. Wie gesagt Username und Passwort funktionieren in KODI tadellos, der Verbindungstest im DVBViewer läuft damit auch, nur hier geht gar nichts??? Are you using the Guest account of the DMS? Xepg requires you to use the "admin" account. The help file says nothing about this, now added. @Pike: Der Fehlercode 12007 weist auf ein Problem mit der Namensauflösung hin. Wenn meine Vermutung (siehe unten) stimmt, verwendet Xepg eine Netzwerk-Schnittstelle, die durch den Internet Explorer bzw. dessen Einstellungen beeinflusst wird. Es gibt ein bekanntes Problem mit dem geschützten Modus des IE 11 und der Adresse 127.0.0.1. Du kannst probieren, diesen Modus auszuschalten (Extras -> Internetoptionen -> Erweitert -> Sicherheit -> Erweiterten geschützten Modus aktivieren), danach PC neu starten, oder (besser) statt 127.0.0.1 localhost zu verwenden. That's why the DMS tray tool uses localhost to open the web interface, not 127.0.0.1. I claimed that the Guest account cannot be used with Xepg. Some GET commands (e.g. api/epgclear.html?source=4) fail when connecting using the Guest account. IMO that makes good sense: A guest user should not be allowed to dele any EPG. 1) The cgi-bin/EPGimport seems to work for the guest account, maybe it shouldn't? For testing the connection I use api/version and api/status2. They work for the Guest account so Xepg will report the connection OK, but the import might fail. Not so good. 2) Is there a way to test whether the "Authentification" or the "Guest" account is used? That would be the best solution. I have written in the help file that the Guest account should not be used, but will they read it? 3) Maybe all the problematic GET commands should be allowed for the Guest account? (there is also httpGET(GetCommand + Clients + '&cmd=-x8276'); for updating EPG in clients). That way Xepg will work for the Guest account as well. Did the localhost instead of 127.0.0.1 work? The output of api/status2.html contains a "rights" element. It's content is "full" or some other value (don't remember which exactly). If the content is not "full" the user only has guest privileges. Thanks. I can now make a consistent UI and post an error message if rights are not "full" (the other one is "read"). danke an alle für die Unterstützung, aber war ich beruflich unterwegs und konnte mich erst jetzt weiter mit dem Problem befassen. Leider hat alles nicht geholfen. Der Fehler 12007 bleibt immer genau so stehen, keine Änderung. Im Media Server Web Interface wird in der Adresszeile "localhost:8090" angezeigt. Grundsätzlich findet der PC den localhost also schon. Mit Netzwerkeinstellungen tue ich mich etwas schwer, ich habe im Netz recherchiert, bin da aber auch nicht weitergekommen. Wenn noch jemand eine zündende Idee hat, wäre ich wirklich dankbar. For me it is localhost:8089 (the deafult value in DMS). I use 8089 in Xepg as well. 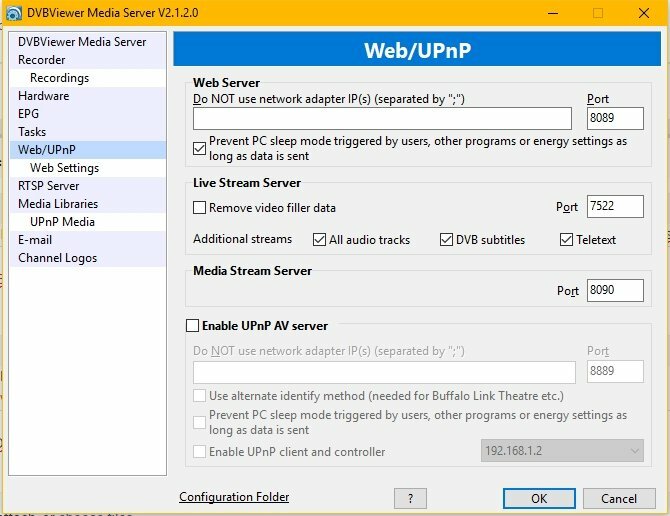 DVBViewer Media Server -> Configure -> Web/UPnP. Use the port from group "Web Server". I have looked into my code (old stuff). Xepg converts the UserName and the PassWord to AnsiString, the only thing accepted by DMS (formerly Recording Service) at that time. If you use special characters (e.g. ☆) that might cause problems (Character loss). If it still doesn't work, you could try to temporarily change the UserName and PassWord using ASCII characters only. ASCII solves the problem, unbelievable. I tried to make a strong password, which caused the trouble. Thank you for your support, problem solved. Ist es möglich (vielleicht auch erst in der Zukunft), mittels Kommandozeilen-Parameter den auszuführenden Job/Grabber auszuwählen? Ich denke dabei an ein Szenario mit 2 Jobs/Grabbern, von denen der eine täglich, der andere nur zweiwöchentlich laufen soll. Thanks for the flowers. I plan in some (not near) version of Xepg to split the Config.ini into 2 files Xepg.ini and an xml file (containing the jobs/grabber) . I have made a note on that the xml file could be taken as a parameter. Help to understand why the EPG is not loaded. Perhaps the reason for the expansion. gz? The EPG is successfully loaded into the file but is not displayed on the channels. Perhaps you need to configure in DVBViver? You need to launch Xepg and click the Help! button to understand how Xepg works. Amongst other things a channel pairing must be done. A problem is that a the MyTVGuide.gz is a compressed file. it should be uncompressed (winzip) before it can be used by Xepg. or maybe there is a better link that delivers the file as an xmltv (.xml) file? Maybe yo can construct a .BAT or .vbs file that downloads and uncrompresses the file to say MyTVGuide.xml? It is recommended to convert your IPTV channels (TunerType=4) to a TS Stream (TunerType=6), se forum. Xepg will then work right out of the box! Prompt, after disabling and launching the DVB Weaver, the already loaded EPG disappears. How to do what would be saved until the next update? Normally DVBViewer/DMS automatically saves the EPG imported by Xepg, so I don't understand what you mean. Sorry to say it is not clear, I use the Translator. My question is that at first Xepg successfully loads EPG, everything works. But as soon as I turn off DVB Weaver and start it again, EPG on IPTV channels is absent, although everything was until shutdown.